In most cases entrance to a room to be monitored is not possible and observations have to be done from the outside. Although this is the most difficult way of observation, we have the right solution. We only offer devices of latest technology developed on basis of many years of experience in this field. Our product range, as shown in this catalogue, indicates single units for specific purpose, because one universal unit covering all kind of tasks does not exit. 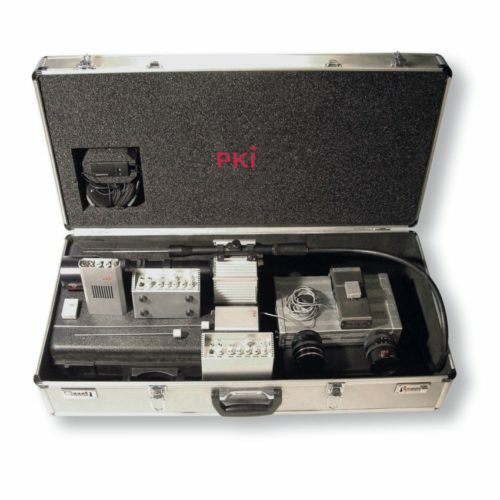 As our customers ask for a complete set of equipment, we have assembled the PKI 2975 Investigation Kit for Outdoor Use. Like our PKI 2970, this set also has been assembled in close co-operation with our customers for a best possible selection of necessary items out of our wide range of products. It consists of each and every item being necessary for room monitoring from the outside but, of course, can be adapted at any time in order to meet customer’s requirement. Each set is packed in aluminium or sturdy hardcover cases for easy outdoor handling. For each single item the complete technical description is listed separately in this catalogue. Depending on customer’s requirement, this kit can be adapted to your specific needs. Just contact us to find the best possible solution for all what you need.